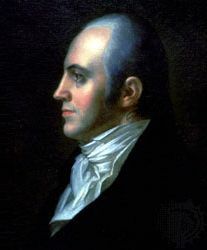 Aaron Burr, Jr. (February 6, 1751, – September 14, 1836) was an American politician, Revolutionary War hero and the third Vice President of the United States (1801 – 1805). He was born in Newark, province of New Jersey. Burr fought in the American Revolutionary War, reaching the rank of Colonel. After the war, Burr was a leader of the Democratic-Republican Party and served in the New York State Assembly, as New York State Attorney General, and as a United States Senator before serving as Vice President. Burr killed Alexander Hamilton in a duel in 1804, when Burr was still Vice President. Burr conspired to form a new country in Mexico. He wanted to be present if and when Spain and Mexico went to war. Some people, including President Thomas Jefferson, who had picked a different Vice President for his second term, saw Burr's actions as treason. However, in 1807 Burr was found innocent of the charges. He was often thought of by his enemies as unreliable. Burr died in 1836. This page was last changed on 12 March 2019, at 23:25.